Louder Than War’s Kat Ball got to have a quick chat with Phil Campbell of Motorhead at this year’s Hard Rock Hell. He was there with his latest group, the All Star Band. Louder Than War: Hi Phil! So obviously you were born and raised in Wales, is this your first time at Hard Rock Hell? 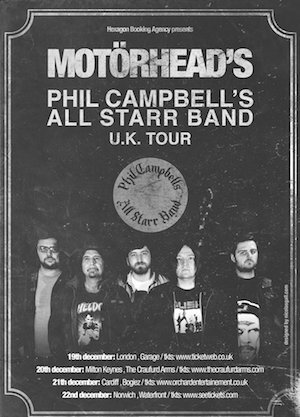 And being a member of Motorhead’s line up for so many years, it must be a bit of a change being here with The All Star Band. How did you guys come together? It’s something I’ve wanted to do for a while. When we get to take some time off from Motorhead, like now, I think it’s a good time to do some stuff, I wanted to keep playing, and have some fun, so I just got some really good musicians around and keep on going, it’s an ongoing thing. So it’s that urge to keep on playing? Yeah, and bring different musicians in. It’s only our third gig tonight! And what is The All Star Band all about, for those unfamiliar with you? We’re just people having a good time, playing a bunch of cover songs, so far it’s been great. I enjoy jumping around on stage like a spring chicken! I think we’ve chosen good material. There’s no big agenda, we’ll just see how it goes. Great! So what was it like then, growing up in Wales, and being into the heavy metal and the rock scene? Were you more of an outcast then, than maybe young people would be these days? I don’t know, I mean if you discover music and you’ve got a passion for it, you’re going to find it anywhere; I used to go to London on the bus when I was young to see some bands! How does playing with The All Star Band compare to being on the road with Motorhead? It’s fun. It’s just, different. We do play some Motorhead songs; we play some of my favourite cover songs it’s just very new and exciting at the moment. And is it right that your sons are in the band with you? Yeah, at the moment, three of them!! That must be really fun? Yeah, they’re all amazing musicians. I mean I started them off, showed them a few chords here and there, but they’ve far surpassed me now! This is the core of the band, but it could change, if we want to bring in someone different and change it up, that’s the whole concept of the band. No rules. With your sons being a part of the band, have you got any advice from your days on the road that you have given them? Yeah, don’t listen to your Dad! So what kind of set can we expect tonight? Really? You’d throw some Tina in there? Yep! Definitely! That’s all I’m going to say. Simple and to the point! Thanks for chatting with us today!! Phil Campbell and the All Star Band can be found on Facebook and Twitter. Motörhead’s website is here. They are also on Facebook and Twitter. All words by Kat Ball. More writing by Kat on Louder Than War can be found at her author’s archive.